8 Jun 2017 Washington, D.C.
COVFEFE from Union Pub on Capitol Hill! Former FBI Director James Comey, who was fired by President Donald J. Trump, will testify before the Senate Intelligence Committee on Thursday morning–and Washington, D.C., elites are gathered at their favorite watering holes throughout the city to watch the giant nothing-burger testimony. Breitbart News will be covering the political class celebration from here, with this livewire including updates on Comey’s testimony and the reaction of the crowd of Washington elites. Union Pub, a landmark Washington, D.C., bar across the street from the Heritage Foundation on Capitol Hill, is offering all patrons who come here to watch the testimony free drinks whenever President Trump Tweets about the Comey hearing throughout its duration until 4 p.m.
UPDATE 12:54 P.M. President Trump did not Tweet throughout the entire event, but Union Pub is still giving out a few round of America-themed Budweisers to everyone here! The specialty Budweiser cans, which servers are passing out now, have the special “America” name in place of “Budweiser” on the label and a camouflage design instead of the traditional red cans. That’s all folks, we’ll leave it there for today. COVFEFE to everyone and thanks for tuning in! UPDATE 12:50 P.M. As the public part of the hearing adjourned, and Comey has completely vindicated Trump ahead of a later closed session hearing where he and senators are likely to discuss classified information he could not bring up during the televised hearing, the whole thing turned out exactly like Breitbart News Network told you it would: A giant nothing-burger. Except for the fact that Comey admitted he is a leaker, has a network through which he has leaked information designed to harm President Trump. Oh, and that former Attorney General Loretta Lynch and other Obama administration officials may have engaged in serious misconduct worthy of further investigation–which Comey testified about today. Meanwhile, White House spokeswoman Sarah Huckabee Sanders–from the podium at the press briefing–has told reporters that President Trump is not, despite what the leaker James Comey says, a liar.
.@SHSanders45: "No, I can definitively say the president is not a liar. It's frankly insulting that that question would be asked." And, of course, nevertheless President Trump persisted. He’s right back out there fighting for American workers while Democrats waste their time on evidence-less nonsense. Am I the only one not able to follow along with senator McCain's line of questioning???? McCain seems to be confusing the Clinton email case with the Russia investigation. Trump, who has not Tweeted during the hearing at all, apparently made the decision to avoid Tweeting last night. Politico’s Tara Palmeri has the scoop of why the President would not Tweet today, infuriating all the Union Pub bar-goers who did not get any free drinks since President Trump did not Tweet. “Why would I?” Trump apparently told White House aides about live-Tweeting Comey’s appearance before Congress, according to a “senior White House official” who spoke with Politico’s Palmeri. Read the whole thing, including the details on how the president’s mood is “light” during the Comey testimony. UPDATE 12:37 P.M. Their hopes and dreams dashed by Comey completely vindicating Trump in this open hearing, and instead implicating ex-Obama administration officials like Loretta Lynch–and implicating himself as an anti-Trump leaker with a network through which he has leaked damaging information against the president–the left and media are pinning everything on a last ditch line of questioning from Sen. Kamala Harris (D-CA). Meanwhile, anti-Trump Never Trumper Max Boot is in an alternate reality, saying Comey was fantastic as a witness. Bottom line for #ComeyDay: Comey a highly credible witness. Trump isn't. Comey makes damning accusations. Trump denials unconvincing. UPDATE 12:24 P.M. Harvard law professor Alan Dershowitz is calling for the Senate to officially subpoena the documents James Comey ordered leaked through his network of leakers. Senators should ask Comey the name of the Columbia professor and then subpoena the memos from him. UPDATE 12:21 P.M. Loretta Lynch is in serious trouble right now. Looks like the Democrats’ efforts may have backfired. Comey also just testified that he did not believe that Lynch could “credibly deny” the Hillary Clinton email scandal investigation, and that she had a serious conflict of interest. He also testified in exchange with Sen. John Cornyn (R-TX), the Senate Majority Whip, that it is possible a special prosecutor was needed for the email scandal. He said he considered calling for appointing a special counsel in the scandal, but decided against it. UPDATE 12:05 P.M. There are now serious questions being raised as to whether Loretta Lynch, the former Attorney General from the Obama administration, will be subpoenaed to testify after this hearing where Comey has implicated her. Legit question: is Loretta Lynch going to be subpoenaed as a result of this testimony? The memos could be viewed as gov't material and potential evidence . Leaking to a friend for disclosure can raise serious questions. UPDATE 12:02 P.M. Donald Trump, Jr., highlights an excellent question from Sen. Roy Blunt (R-MO) to Comey. Comey did not have a great answer. UPDATE 12:01 P.M. From our RNC friends, here’s video of Sen. Rubio crushing another leftist media narrative during his questioning of Comey. Basically, Comey was so concerned about President Trump’s conversations with him that he alerted exactly nobody who could do anything about it. In other words, this whole thing is a giant nothing-burger. Except for Comey implicating himself as a leaker. President Trump still has yet to Tweet, so no free drinks yet here at Union Pub. Looks like the owners here made a smart decision since this place is standing room only right now. UPDATE 11:54 A.M. Oh, man, this keeps getting better and better. Comey just shredded the Democrats AND now the fake news media. Oh Boy. Comey says there have been many many stories based on classified information about Russia that are just "dead wrong"
I wonder if any of the media outlets that have printed repeated stories on these matters will check their reporting again or correct it if they’re wrong. Not holding my breath. UPDATE 11:50 A.M. Comey has emerged throughout this hearing before the American people looking very much like a drama queen. One of the more memorable lines is when he says when Trump called him to ask him if he was free for dinner, he had to break a date with his wife. Comey says Trump called him at his desk. "Free for dinner tonight?" "I said yessir…I had to call my wife and break a date with her." COMEY JUST QUOTES HENRY 11 on what he thought Trump meant: 'Will no one rid me of this toublesome priest"
Meanwhile, even CNN’s Jim Acosta–a vehemently anti-Trump media figure in the heart of the opposition party’s mothership CNN–is joining in on the anti-Comey fun. Giving info to media "like feeding seagulls at the beach?" Fact check: True. UPDATE 11:48 A.M. The leaky Capitol Hill GOP swamp aides are attacking Trump, despite the fact Comey has vindicated the president and implicated himself in potentially illegal leaks. The fact that Swamp Creatures on the “Republican” side on Capitol Hill are throwing shade on their own president, and party, as the GOP and Trump likely emerge from today’s masquerade mostly out of the woods is simply incredible but unsurprising. Swamp Things are going to Swamp. UPDATE 11:45 A.M. Comey’s open admission he orchestrated a potentially illegal leak puts him in serious potential trouble, the New York Times people note. That’s the story folks. He vindicated Trump, and implicated himself. Wow, what a day. Can’t remember the last time someone in DC openly acknowledged orchestrating a leak — and without any senator having even asked. UPDATE 11:39 A.M. CNN’s Dan Merica says that President Trump’s personal lawyer Marc Kasowitz will make a statement at the end of Comey’s public testimony. Her “homey” James Comey, meanwhile, has actually admitted he is a leaker. Comey admits to @SenatorCollins that he asked a friend to leak the contents of his memo to NYT to prompt the appointment of Special Counsel. UPDATE 11:32 A.M. While obstruction is now off the table for Trump, as Breitbart’s Joel Pollak detailed, Breitbart’s John Hayward notes that obstruction is back on the table for several leading officials from now former President Barack Obama’s administration. Hayward says Congress needs to investigate Loretta Lynch, the former Attorney General, as well as Obama and former Secretary of State Hillary Rodham Clinton–the 2016 Democratic presidential nominee–for obstruction of justice. 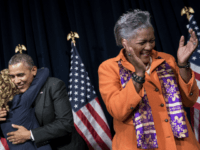 “Democrats have hinged their hopes for impeachment — and reversing the 2016 elections — on the idea that Trump committed obstruction of justice. That case has now been smashed beyond repair,” Pollak writes, pointing to a Comey exchange with Sen. Jim Risch (R-ID). UPDATE 11:26 A.M. Former Mexican President Vicente Fox, who has trolled Trump as much as he possibly can over the campaign and since, is joining with Union Pub patrons–who get free drinks if President Trump Tweets about the Comey hearing–in raising concerns with the lack of Tweets today from President Trump.
.@realDonaldTrump's silence on #ComeyDay concerns me. What's going on, Don? I hope you don't hurt your fingers ranting against Comey later. UPDATE 11:25 A.M. Entirely unsurprising, but leading Never Trumper Ana Navarro bashes the president–again–and praises Comey. Lot of time left, but so far, Comey is coming across as the consummate professional. A man who loves his country, colleagues & agency. UPDATE 11:24 A.M. Since Comey has blown up the entire media narrative, essentially, Ric Grenell–a leading conservative pro-Trump advocate–notes that the media is only using “facts” that fit their worldview. Breaking: DC reporters are NOT tweeting the line where Comey destroys their anonymous sourced narratives. UPDATE 11:21 A.M. from this morning’s Breitbart News Daily on SiriusXMTom Fitton of Judicial Watch, , says there is no evidence of any wrongdoing by President Trump or his team. And he called the special counsel “wasteful.” If Robert Mueller, the special counsel, comes up with nothing as every one of his contemporaries has before him, it will be the biggest waste of taxpayer dollars–and of Americans’ time–in a long time. UPDATE 11:16 A.M. James Comey finally confirms before a congressional committee in a public setting–on video–that President Donald Trump is not under FBI investigation. UPDATE 11:15 A.M. During Comey’s back and forth with Sen. Marco Rubio (R-FL), the former 2016 Trump GOP primary rival astutely noted that basically the only thing that did not leak to the press is the one fact that would have helped Trump–that Trump himself was not under investigation. That is despite the fact that Congressional leaders were briefed on that point. Rubio Comey back forth indicates Gang of 8 was briefed that Trump was not personally under investigation. UPDATE 11:11 A.M. Donald Trump, Jr., joins the fray on Twitter, defending his father–the president–from Comey’s ambiguous claims. Trump, Jr., says there is no way Comey would have misunderstood the president. Donald Trump, Jr.’s Tweets come as many here at Union Pub–who will get free drinks if the president himself Tweets about Comey–are disappointed that President Trump himself is not Tweeting. This is probably the first time ever that people in Washington, D.C.–the Swamp–are upset that President Donald Trump is NOT Tweeting. UPDATE 11:07 A.M. Breitbart’s Joel Pollak has an excellent piece up already on how Comey’s opening statement to the Committee this morning is all about him. Also, it’s worth noting that even the Wall Street Journal–not some rightwing blog by any stretch–even says that Comey’s written opening statement proves that President Trump should have fired him. Which is exactly what President Trump did. Read the Journal’s editorial board piece here. Politico has an RNC talking points document circulated this morning. Read the whole thing here. Politico also has a story on how the RNC is taking the lead on pushing back on the highly discredited Comey’s testimony. UPDATE 10:59 A.M. Despite the fact there have been a number of inaccurate pieces throughout the establishment media, the establishment media is celebrating itself. Most interesting part of Comey memo: How damn good the reporting has been. On. The. Nose. UPDATE 10:57 A.M. Feinstein tells Comey he’s “big” and “strong,” then asks him if he was overwhelmed by the Oval Office and wonders why he did not tell the president he was wrong when he brought this subject up with him. He questions whether he would have handled himself the same way if given a second chance. “I hope there are tapes,” Comey also said of his meetings with Trump, noting he has seen the president’s Tweet about the possibility of tapes. UPDATE 10:55 A.M. Comey, under questioning from Sen. Dianne Feinstein (D-CA), says his relationship with Trump got off to a rocky start. He also embarrasses her when she asks him if the reason he was fired had anything to do with the Russia investigation, and he said “yes, because the President said so.” Here in Union Pub, the over-capacity crowd broke out into laughter. UPDATE 10:53 A.M. Comey just killed the case against Trump over “obstruction of justice” that the media is building, as fast as they began building it. He said Trump saying he hopes Comey lets the investigation of Flynn go was not an order to drop the investigation. UPDATE 10:51 A.M. The media is highlighting two separate things early on in the Comey bonanza: The fired former FBI director’s use of the word “lie” twice, and him being concerned about meetings with President Trump. Establishment media going to do their thing. Comey has now used "lie" twice. UPDATE 10:48 A.M. Since Comey has nothing, and the whole case is falling apart, Hillary Rodham Clinton’s ex-spokesman Brian Fallon is sadly offering up that special counsel Robert Mueller is now investigating Trump. Comey said he expects Mueller to assess, as part of his investigation, whether Trump obstructed justice. That would mean he's a subject now. UPDATE 10:40 A.M. Comey testified that he was “confused” about being fired by President Trump. And he said Trump spread “lies” about the FBI. UPDATE 10:38 A.M. 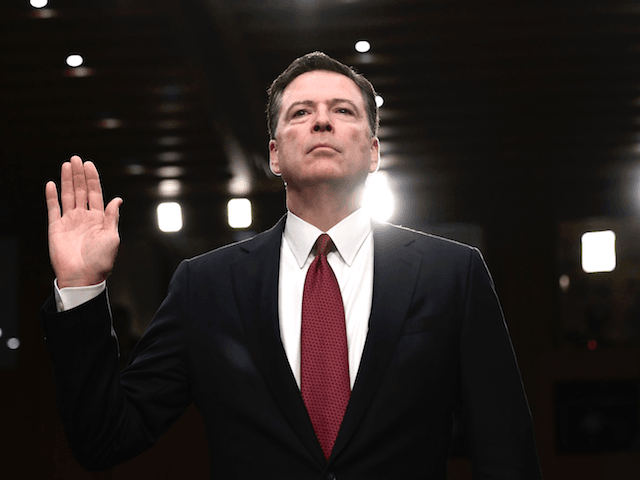 Since Comey believes that no votes were altered in the 2016 presidential election–he testified he is “confident” none were–then what is the point of this hearing? UPDATE 10:32 A.M. Despite the fact that Comey has nothing, but instead actually ended up in his written opening statement vindicating President Trump, the media elites in Washington are celebrating Comey’s “poker face”–as if it means something substantive. UPDATE 10:30 A.M. As Comey comes under questions from Burr, our very own Joel Pollak notes that Comey’s altered opening statement was a deeply personal statement furthering the giant nothingburger he put out last night through the committee. Comey failing again so far, just like he did when he was working on the Hillary Clinton email scandal last year. UPDATE 10:26 A.M. Washington, D.C., elites are having a ball for themselves. There are many more. We’ll get updates up soon. UPDATE 10:20 A.M. Audible gasps of disappointment were heard throughout Union Pub as Comey said he will not re-read his opening statement published online last night, a statement that completely vindicated President Trump. But here in Union Pub, cheers erupted as a champagne bottle was popped open for more Washington, D.C., mimosas. UPDATE 10:17 A.M. As Warner wraps his righteous opening statement, in which he stated “this is not a witch hunt” and “this is not fake news,” the STANDING ROOM ONLY crowd at Union Pub laughs as Comey is forced by the chairman to stand and be sworn in under oath for his testimony. UPDATE 10:15 A.M. This real life parody is getting more and more out of control. Fired ex-U.S. Attorney from the Southern District of New York Preet Bharara is joining Comey in the hearing room. Yes, that is Preet Bharara sitting behind James Comey. Banquo's ghost. Meanwhile, our COVFEFE LIVEWIRE has earned the attention of New York Times media correspondent Michael Grynbaum. UPDATE 10:12 A.M. Mark Warner, the leading Democrat on the Senate committee, opens up with his opening statement saying that this hearing has drawn focus from a lot of Washington, D.C., and that ordinary Americans really don’t care and aren’t paying attention. Maybe Congress could focus on real policy issues when this charade is over, but that would probably be asking too much of our elected representatives. UPDATE 10:11 A.M. Fox News is reporting that President Trump is expected to issue a statement disputing parts of Comey’s testimony. UPDATE 10:04 A.M. As Chairman Richard Burr, a North Carolina Republican, opens the hearing, a hush comes over the crowd inside Union Pub. COVFEFE everyone! Here we go. UPDATE 10:03 A.M. James Comey has walked into the room where is going to testify in the Senate Intelligence Committee. Folks at Union Pub don’t really seem to care much as they are engaged in deep conversation, very loudly, so loud one cannot hear the television. UPDATE 10:02 A.M. Comey’s written testimony published last night basically proved he had nothing on Trump, and this whole case is going nowhere. Even anti-Trump Republican Sen. Lindsey Graham (R-SC) admits that, saying none of this makes any sense on TV this morning. UPDATE 10:00 A.M. Union Pub is up and running as the Comey hearing is about to begin. All the TV’s in the bar are carrying Fox News live. Yes, our White House correspondent Charlie Spiering is correct! Breitbart News will be running this COMEY CRAZY COVFEFE LIVEWIRE live throughout the hearing and festivities all day from Union Pub! Our Pentagon Correspondent Kristina Wong is here with us, as well as our intern Alex Clark. More Breitbart staff are expected to join throughout the day! UPDATE: 9:52 A.M. Owen, a federal government employee who did not want us to publish his last name but is here partying as Comey is set to testify, said about the crowd size here “it’s about what you’d expect–people here [in Washington] are easily more engaged than everyone else in the country. It’s a symbol of a healthy, vibrant democracy.” Bloody Mary’s and Mimosos and beers by the pint are being poured by the hundreds already and Comey has not yet taken the stand. UPDATE 9:50 A.M. Breitbart’s summer intern Alex Clark joins us here and spoke with Union Pub’s general manager Ashley Saunders who told us “I’m way too busy–I’m swamped” when he asked if she could do a brief interview before the hearing begins. Union Pub is packed to the brim with Washingtonians celebrating Comey’s testimony.